So far, it has been a month since Lak Chantrea received solar lantern packages from the iHerb Charitable Foundation through project in Kampong Leng District. Chantrea, is a Grade 7 student of Samrong Sen Secondary School. 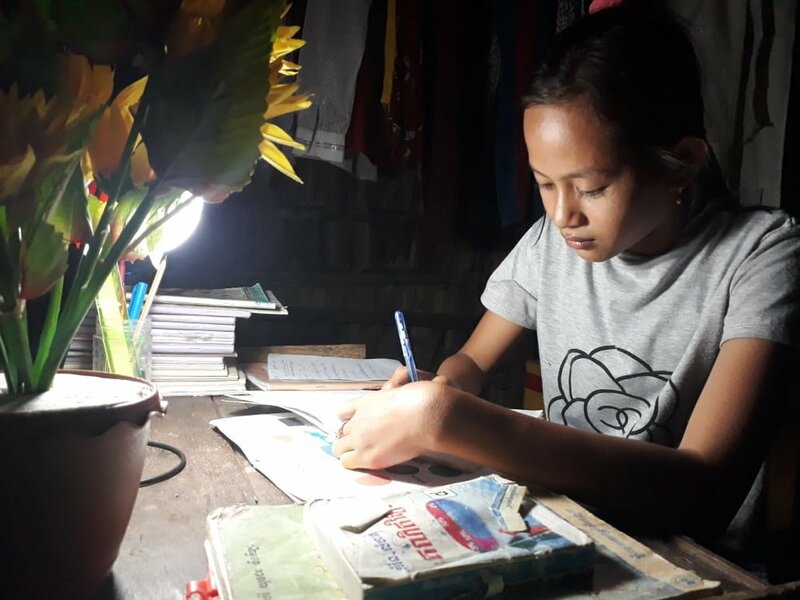 She is also a student of iHerb English Language Satellite School, who has been using solar lamp to enlighten her reading and doing homework during night time. ឡាក់ ចន្ទ្រា ប្រើប្រាស់ចង្កៀងសូឡាសម្រាប់ការរៀនរបស់នាង Lak Chantrea uses solar lamp for her studying. 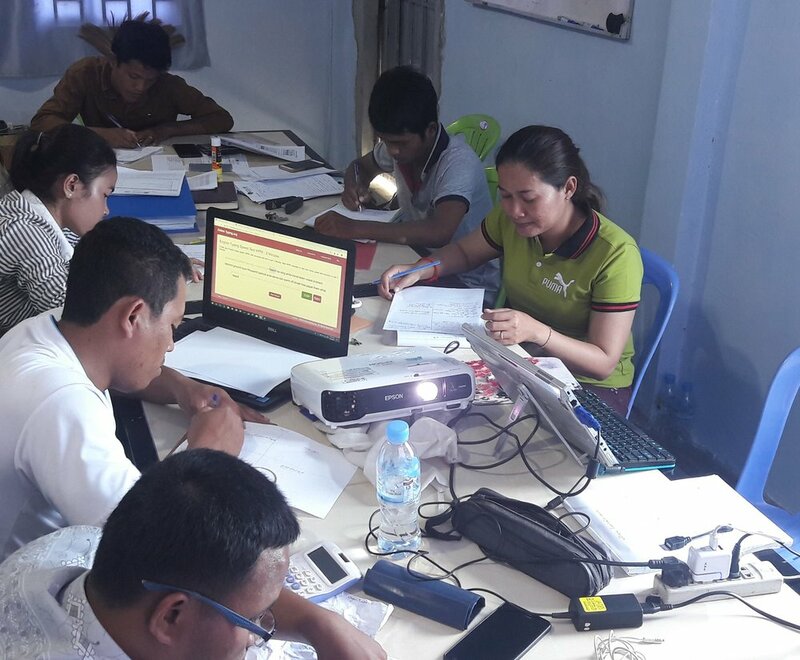 September 18 to 21, 2018: The management team reviewed and prepared all necessary documents and everything for the hand over the existing pilot project (English Language and Students Support Project) in Kampong Leng District to GoAhead Organization for their further implementation. While doing it, the team paid a visit to view the status of a beneficiary, the team had also learned together on beneficiary case story development and performed SWOT analysis for individual and the project. Project is sponsored by iHerb Charitable Foundation. The Cambodian Children's Advocacy Foundation Organization is proud to be part of the implementation of the educational program through village-based preschool and foreign language for small children and adult in the target areas including Kampot and Kampong Speu provinces, and Kampong Leng District, Kampong Chhnang Province. We encourage all stakeholders to participate and support the educational program. We thank our colleagues, funding partners, communities and the government in assisting the programs. Activities of preschool teachers conducting data gathering of children, 3 to under 6 year old, for new School Year 2018-2019 at Ta Eak, Sre Prey, Chraksdao, Damnak Chambak, Paurn, Trapeang Montrey, Trapeang Kdol, Tamom, Preythom and Kung Ruth villages, which all of these communities are the target area of the Village Based Preschool Project that coordinate by Cambodian Children's Advocacy Foundation Organization. All photos are provided by Village Based Preschool Project Unit Mrs. Yeng Sarang and English Teacher Thea Panha. Demchamreak Village Based Preschool Teacher Noun Saren, and Tkov Village Based Preschool Teacher Tun Sopheak conduct data gathering on the number of children, who are 3 to below 6 year old for new school year 2018-2019 planing. អ្នកគ្រូ នួន សារែន គ្រូមតេ្តយ្យសិក្សាសហគមន៌ភូមិ ដើមចម្រៀក Teacher Noun Saren at the house of a villager in Demchamreak Village. Damnak Chambak. អ្នកគ្រូ ទុន សុភ័ក្ត គ្រូមតេ្តយ្យសិក្សាសហគមន៌ភូមិថ្កូវ Teacher Tun Sopheak at the house of villager in Tkov Village.